A native to Iran and central China. A vase-shaped, often multi-stemmed, broad-spreading small tree, that forms a flat-topped crown. Green leaves are alternate, bipinnately compound to 20" long, with 10 to 25 pinnae, each with 40 to 60 leaflets. Leaflets are oblong, very oblique, 1/4" to 1/2" long. Fruit pod is 5" to 7" long, 1" wide and light gray brown in color. Extremely adaptable. Will withstand drought, high pH, soil salinity, and high winds. 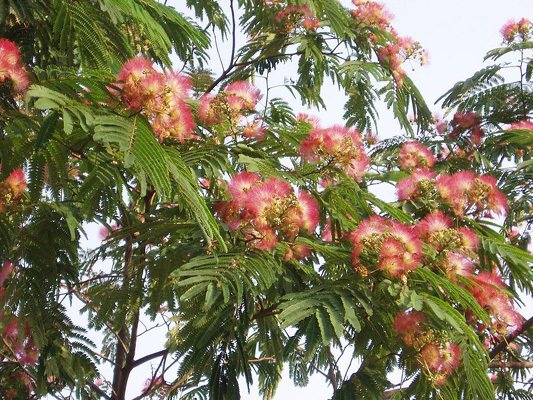 Foliage and silky pink flowers produce a tropical effect. The tree has a fast growth rate if given regular deep waterings. Light to deep pink, fluffy, silky, in clusters. Good patio tree, although it wil drop leaves, flowers, and seed pods.